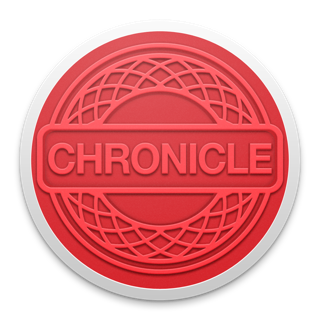 With notifications, and upcoming bills in your menu bar and notification center, Chronicle will always keep you up-to-date. 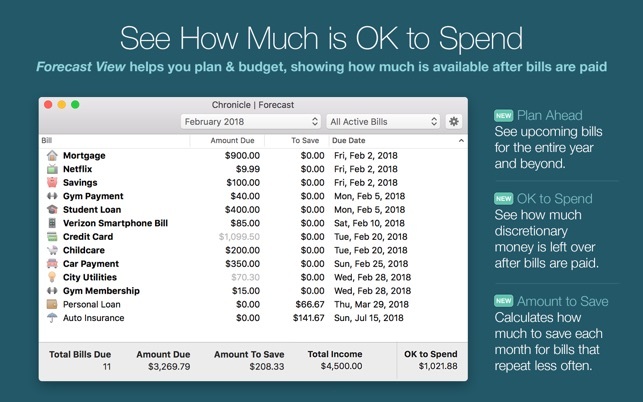 Chronicle takes into account your monthly income, your bills, and even bills you have to set aside a little for each month (such as insurance payments, annual memberships, etc), and tells you how much money you can safely spend each month. Forecast View shows you upcoming bills months in advance. Amount-To-Save feature calculates how much you need to save each month for bills that repeat less often, like an annual insurance bill or car registration. 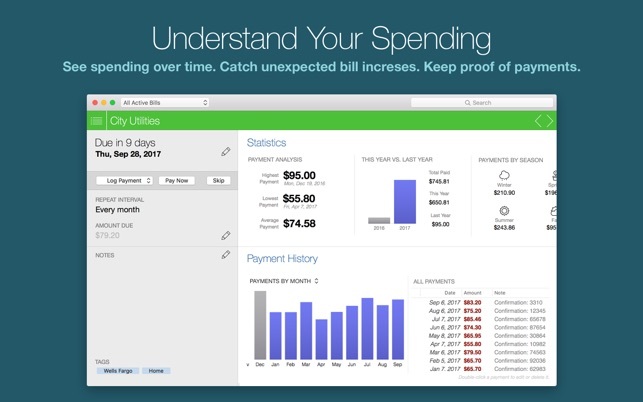 Intelligent Estimated Amount Due feature estimates how much is due for bills that vary, like credit cards or utilities, using your payment history and the time of year. 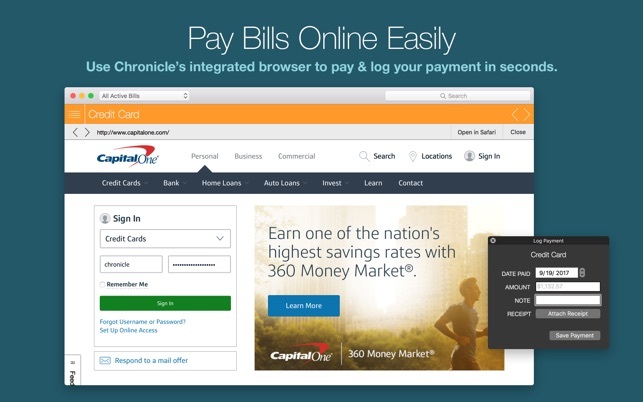 Pay bills online and log them in seconds using Chronicle's integrated browser, and keep proof of all your payments, including storing receipts. With month-by-month payment history, and annual reports, you can break down your spending by bill or by specific tags, so you can understand where your money is going. If you pay bills, you need Chronicle. It gives you peace of mind and control of your financial future. One late payment can wreak havoc on your credit score, leading to higher interest rates and denied loans—in short, completely affecting your financial life. With Chronicle, you can make sure that never happens. 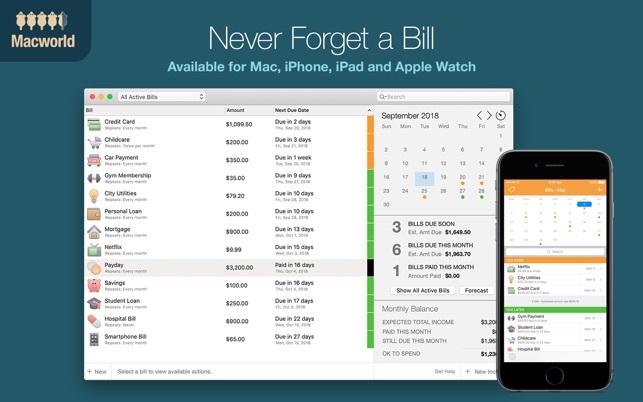 Plus, Chronicle can sync with the available iOS version, so you always have your bills available wherever you go. MACWORLD gives Chronicle 4.5 out of 5 mice: "Chronicle is one of the slickest finance apps available for the Mac. 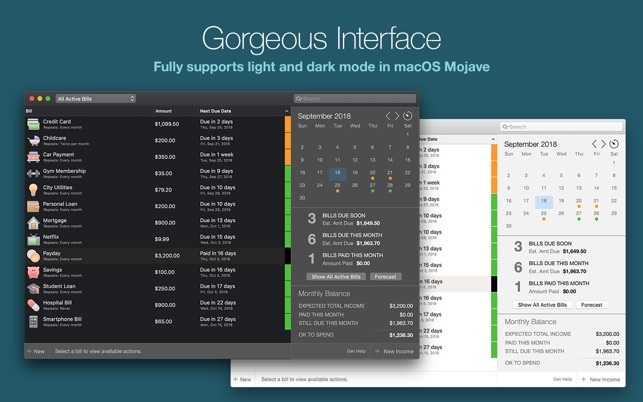 It’s easy to use and easy on the eyes, and it’s worthy of a spot on anyone’s dock." Chronicle is now Chronicle Pro! Version 9.0 is a major update with significant new features, including history, savings goals and reports. 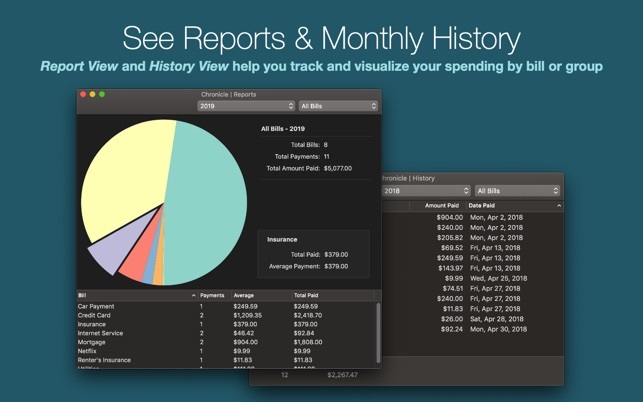 Gain better insight than ever into your finances with the new Chronicle 9.0. 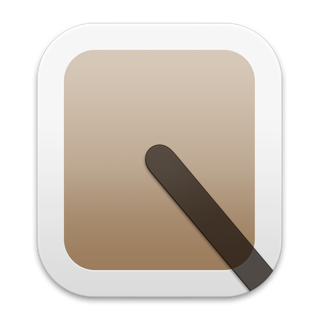 Version 9.0.1 fixes some minor autolayout issues from version 9.0. Purchased version 8 to use on my iMac (High Sierra) and I’ve had a problem every time I go to edit a bill. The program corrupts and the window fails to load. I have to replace/rename the database file with the icloud synced version to get my data back. I discovered that after days of testing, since I never got any actual help from customer service. I sent them my crash logs but I guess it was too much trouble for them to solve the problem. So, once again I tried to edit a recurring date, and the same thing. Reloaded the file from the icloud version to get the app functioning again, but clearly I can’t edit any existing bills. In the early days of the app, customer support was great, very fast response and efficient. This last time, though, it was a couple weeks and I still never received a resolution. Guess I will not be able to edit my bills. When I try to edit them on my iphone app, the app crashes every time. Now looking for a new program and very sorry I updated to version 8. I wanted a program that focuses on my bills and nothing else. How much do I need to pay this month, and when do I need to pay them? Something that just gives me a clear reminder and tracks when and how much I have paid in the past. Chronicle has been perfect for that. It’s really easy to use, has a lot of customization options and is pretty to look at. It also does little things that I love, like breaking down bill history by seasons, months, and year. My only complaints are that settings don’t seem to sync with the iOS version, and the default options aren’t quite the same. 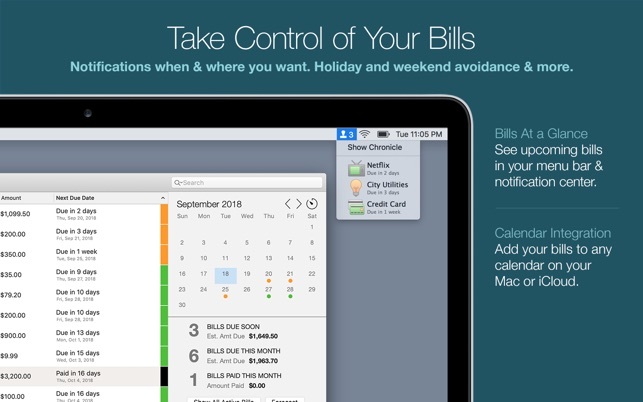 The iOS version defaults to pay automatic bills automatically, which is not how I have the macOS version set up. So when I first opened it the iOS version it marked bills as paid that I didn’t want marked yet. Other options I have since changed I had to change manually in the iOS version. Not a big deal, but annoying. Also the interface can get a bit wonky. The bill detail window has lots of charts and displays, so I make the window bigger to see them all at once. But then your overview screen gets all these uncessary spaces as it tries to spread everything out to make use of the window size. Again, not a big deal, but annoying. I highly recommed this program. it focuses on one thing, and does it very well. This application is extremely well designed and versatile in usage. I was looking for a way to document and observe my monthly expenses and note how much my expected monthly saving should be. I'm not using the bill pay feature, and have most of my payments set to auto-pay which results in zero maintenance overhead while at the same time proving insight on where my money is being spent. None of the budget apps allow me to provide this is a simple easy to use interface. I call it a hidden gem as for months I've searched the web and the apple store for such an app but never did find it. Perhaps it's because of the app name and the lack of use of the keyword Budget or Planning. So glad to have stumbled upon it and the complementary iPhone app is a huge plus.